Foreign Affairs Minister Chrystia Freeland, left, with U.S. Trade Representative Robert Lighthizer, centre, and Mexico's Secretary of Economy Ildefonso Guajardo Villarreal. MONTREAL — Canada’s NAFTA automotive proposals were slammed by U.S. Trade Representative Robert Lighthizer as the sixth round of trade talks closed in Montreal. He says enough progress has been made over the past week to warrant moving forward with a fresh round of renegotiations in Mexico, but he's also making it clear that more work needs to be done. Lighthizer is not happy with Canadian proposals to break a logjam on autos, and he accused Canada of mounting a "massive attack" on its trading regime with its wide-ranging complaint to the World Trade Organization. He panned Canada's proposal on autos, calling it a "poison pill" that would do the reverse of what was intended. Canada has suggested new ways to calculate whether a car counts as American, including a breakdown of its high-tech components. Lighthizer said the proposal would lead to less North American content, the "opposite" of what the trade agreement is supposed to achieve. The NAFTA negotiations have made progress, but Canada, the U.S. and Mexico owe it to their citizens to pick up the pace of the talks, Lighthizer says. 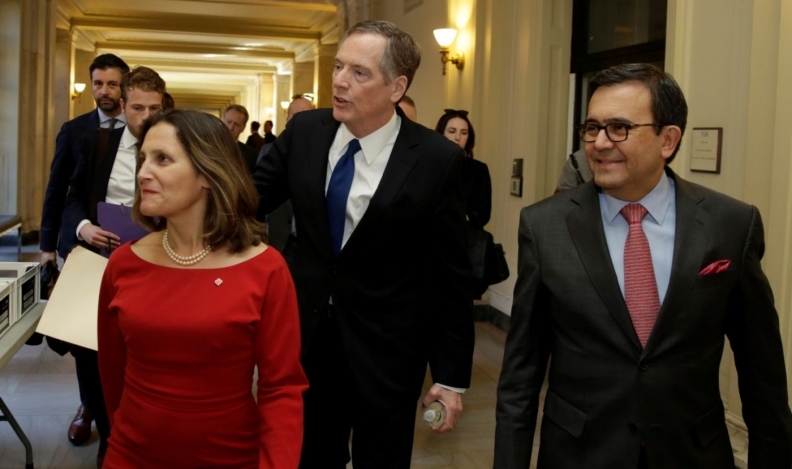 Lighthizer delivered his long-awaited verdict on the sixth round of marathon talks in Montreal at a public event today with Foreign Affairs Minister Chrystia Freeland and Ildefonso Guajardo of Mexico. The three held a series of face-to-face bilateral meetings before their final closed-door, three-way huddle. It was the first such group appearance since the trio's memorably tense encounter in the fall. Numerous participants in the Montreal round were sounding cautiously optimistic in the lead-up to Monday's closing statements, calling the latest talks less negative and more constructive than recent ones, with the first true dialogue on serious sticking points — autos, dispute resolution and a five-year review clause in particular. With just eight weeks left in the current schedule of talks — and with U.S. President Donald Trump frequently threatening to blow up the deal — all eyes were on Lighthizer. Dave Reichert, an American lawmaker who spoke with Lighthizer, said he sounded hopeful. But Reichert warned not to expect too much enthusiasm given the U.S. trade representative's famously gruff style. Indeed, when asked by reporters how talks were going, he told his security detail to walk faster and sped away from the scrum. "He says he's a curmudgeon," Reichert, the Republican chair of a congressional trade committee, said Sunday. "So when he shows optimism it may not be, you know, readily visible to the rest of us ... because we have difficulty sometimes discerning that ourselves.... He recognizes there's a great deal of work to be done, but he's hopeful." Important decisions about NAFTA's future are now in the hands of Trump's administration. American negotiators passed the baton on Sunday to political decision-makers how to major discussions about autos, dispute resolution and a five-year review clause. In Montreal, Canada brought what it billed as "creative" proposals to the talks moving forward on the other major sticking points. On dispute resolution, the Canadians and Mexicans worked out a proposal to create a new investor-state dispute system that applies only to them, but U.S. has said it might want to opt out of the system. On the review clause, the U.S. has proposed a rule that would terminate NAFTA every five years unless it's maintained by all three countries. Mexico responded a few months ago by proposing a watered-down version, which would force countries to periodically review the effects of the agreement — but without an automatic-termination rule. There was less progress in other areas — including dairy and labour standards — which means big hurdles moving forward. U.S. Democrats and Canadian unions are expressing frustration labour hasn't gained more prominence. American milk producers are demanding greater access to Canada's supply-managed system, and the issue is certain to resurface later.